Psychology of designing a colorful office or workspace. Maximizing real estate while boosting productivity, culture, creativity, and comfort – all while staying on budget – is what keeps most facility planners up at night. But what if your office design had a secret weapon that could help with a few of these items in a way that was easy on the bottom line? That secret weapon is color! Adding the right pop of color throughout a workplace can help set the tone, boost productivity, or add a layer of serenity all depending upon your goals. Color Psychology, the study of color in relation to human behavior, is an important aspect to keep in mind in the transformation of a workplace. 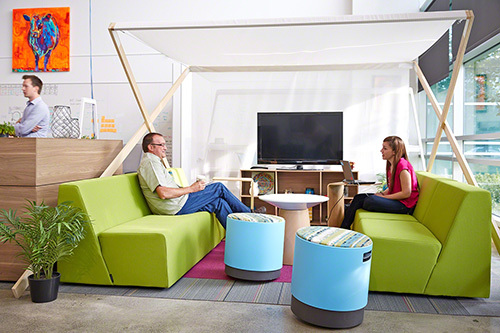 Adding a bright accent of color in a collaboration space can boost energy levels. Need to send a signal that a particular space is geared for quiet, focused work? Try painting the walls in a soft, natural hue. Color can have a profound impact on a space and should be leveraged accordingly! 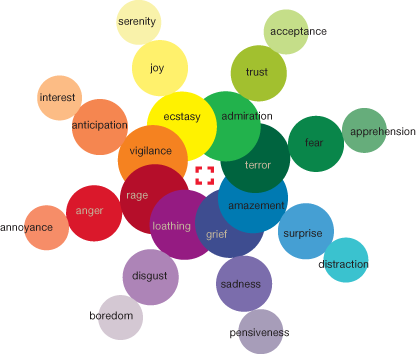 Here’s a chart based on the work by Robert Plutchik called the ‘Wheel of Emotions’. There are many ways to introduce color into a space – through wall paint, furniture, textiles, accessories or wall graphics. Blue, one of the most popular colors, has been proven to increase productivity and stimulate performance. Blue also encourages loyalty, trust, responsibility, and peace—important aspects to emphasize in an office space in an effort to minimize conflict and create relationships. The buoy by Turnstone in a bright blue fabric, peppered throughout a space, might help encourage employees to be more active. Green is associated with broader thinking and is said to ignite creativity. For many people, green symbolizes nature and regrowth which positively correlates with productivity. A green accent wall or a Cobi chair in basil green would be perfect in a space where brainstorming occurs. Furthermore, green also encourages relaxation. Incorporating green in the workplace can promote health and wellbeing by alleviating stress. Adding a little orange or yellow into the mix can be an energetic boost of optimism. Designtex’s creative wall coverings or a pendant lamp with a splash of orange can provide a psychological boost especially in a collaborative space or work café. Choosing the right color can be a powerful tool when designing a workplace – especially when you know the ABC’s of color psychology!